Project obstacles and solutions: Magnetation, LLC is building a new $350 million iron ore pellet plant at Reynolds in northwest Indiana. The plant is serviced by rail lines that connect iron sources in Minnesota and AK Steel blast furnaces in Ohio and Kentucky. The Reynolds facility is scheduled to be operational by the fourth quarter of 2014. The Reynolds site includes numerous manufacturing buildings and operations specific to rail and production of iron ore pellets. Among those is a rotary rail dump pit where rail cars are literally turned upside down to dump raw materials into a collection pit. Vision IV Construction was contracted to excavate and build the rotary pit. Geiger Excavating dug the pit and Midwest Concrete finished the concrete. The floor of the pit required 3,100 yards of concrete. 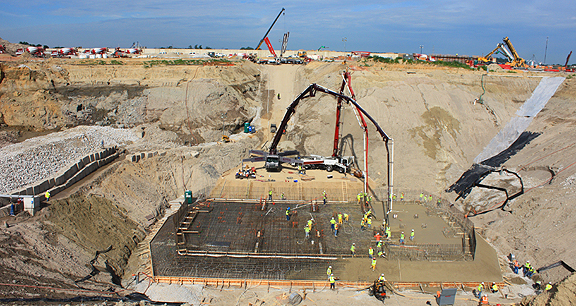 The concrete pour was to be continuously pumped to the site until the floor was complete. This project used four concrete pumps. Two were placed at the top of the hole and pumped to two other pumps at the bottom of the pit. The two bottom pumps then delivered the concrete to the crew at the site. IMI supplied concrete from two separate plants: the Remington, Indiana central mix plant and a portable plant in Monon, Indiana. The Lafayette plant was used as a standby in case production needed to be accelerated. IMI utilized five-axle mixer trucks and drivers out of Monon, Remington, Lafayette and West Lafayette to supply the project. This created a lot of truck movement to take care of regular business from many other locations throughout northern and central Indiana. Drivers were rotated to accommodate safety requirements. Trucks were spaced to cycle in and out of the concrete plants and onto the job site methodically so there would be no break in the delivery of concrete. IMI QC/QA were on site to test each batch as the trucks entered the job site. Since the ability to pump the concrete onto the site was critical to this job, IMI QC/QA suggested the engineered specifications be changed to allow smaller coarse aggregates in the mix. This proved to be crucial in keeping the pumps working throughout the pour. When you are pumping concrete the distance needed for this pour, flowability of the concrete is critical. IMI delivered up to 250 yards of concrete per hour during this 18 hour pour.